I said I would give away a copy of Traffic Secrets 2.0 if I win the Best Personal Blog of Vancouver and since I did, Traffic Secrets 2.0 is up for grabs! 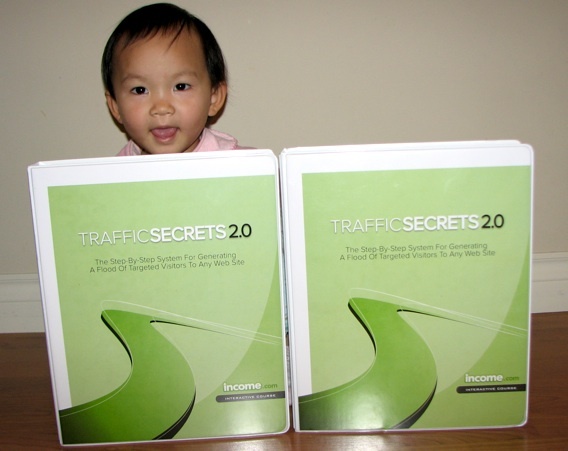 Traffic Secrets 2.0 sells for $397 and it’s worth every penny. You can read my full review of the program here. Normally, for a prize this big, I would make the entry requirements pretty high. However, I’m going to make this contest super easy. To enter for a chance to win Traffic Secrets 2.0, simply reply to this post and you’ll be in the draw with one entry. You only need to reply once. Replying multiple times won’t get you anymore than one entry. However, if you blog about this and send a trackback, I’ll give you more five entries. Also, If you send out the following to your Twitter list, I’ll give you three more entries. Deadline for entries is midnight on Friday. Winner will be draw on Saturday during Dot Com Pho.